Boom arm gives you the ability to look at larger items. 30 degree incline saves strain on your neck when using this microscope for a long period of time. Interchangeable pairs of 10X 18mm eyepieces and 20X 10mm eyepieces. Adjustable goose neck LED light allows you to adjust the light to where you need and want it. When you purchase the AmScope SE400Z Professional Binocular Stereo Microscope you should find the following in the box. 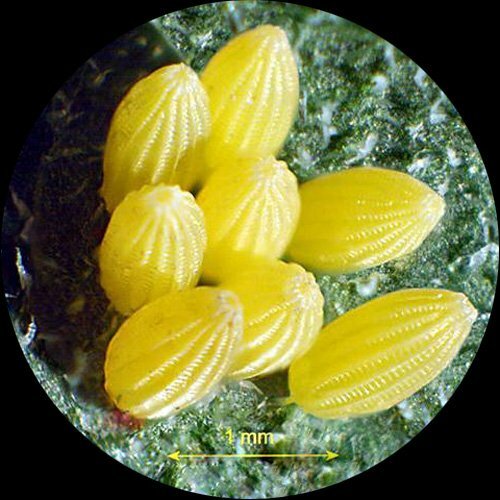 In order for you to better determine whether or not the AmScope SE400Z Professional Binocular Stereo Microscope is the right microscope to meet you needs we are focusing this review on 4 areas; design, performance, Usability, and function. We have also rated each category from 1-9 based on how well this microscope will meet the needs for which this microscope is intended. 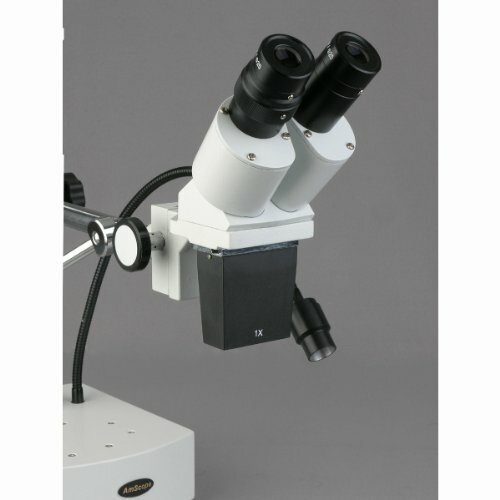 This microscope is sold for a budget price and is extremely well designed for that price. 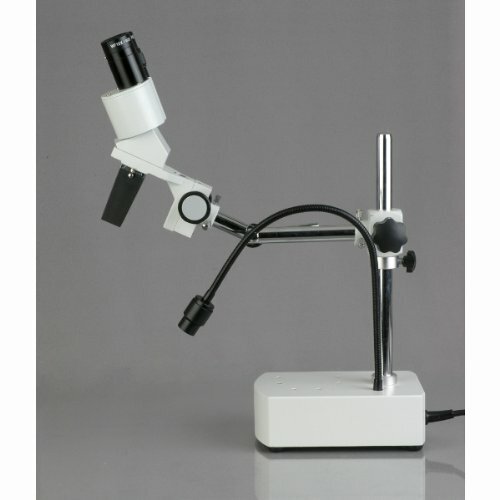 Made mostly of steel or cast metal with a nice overall finish this microscope is great looking. 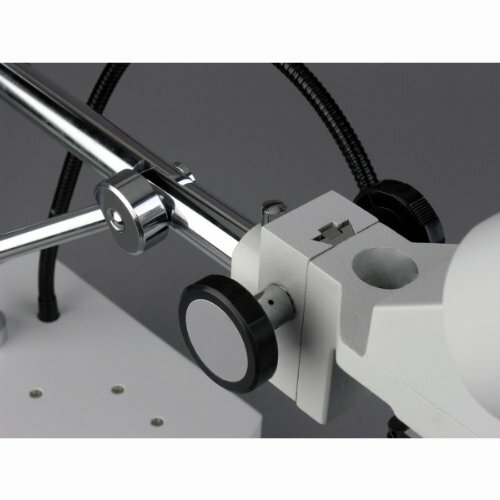 The design of this microscope includes a 30 degree incline and a boom arm on the LED light that allow you to position the light directly overhead and from the side. Although the base is sturdy, it still can be tipped over easily if bumped just right especially if the boom arm is turned towards the back of the microscope. The 9 inch vertical working distance is perfect for viewing larger objects and users find this the perfect distance for working on circuit boards and even viewing rocks. While we find this microscope to be well designed overall we did give 7 stars do to the microscope’s tendency to tip over. 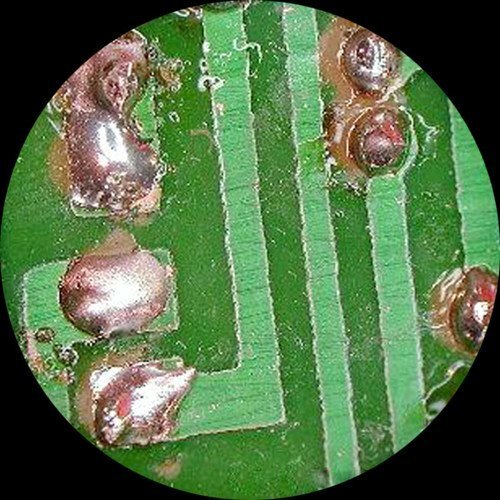 For being a budget professional microscope the AmScope SE400Z actually performs incredibly well. 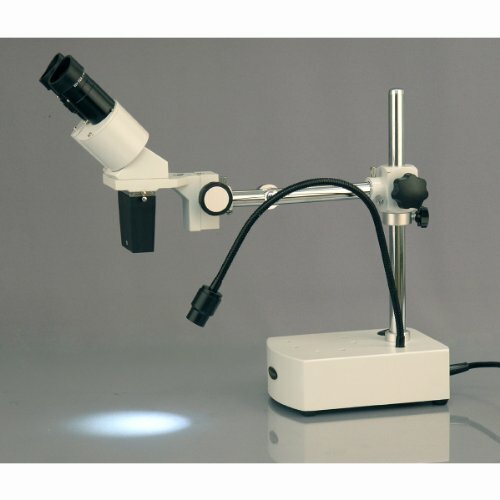 Users find that this microscope has an excellent working distance and depth of field allowing them to do close inspections of circuit boards and other close work. The 10X and 20X wide field lenses allow you to closely inspect fine work or fine details on circuit boards and other projects. Users find the adjustable LED light arm makes directing the light where you need it relatively easy. 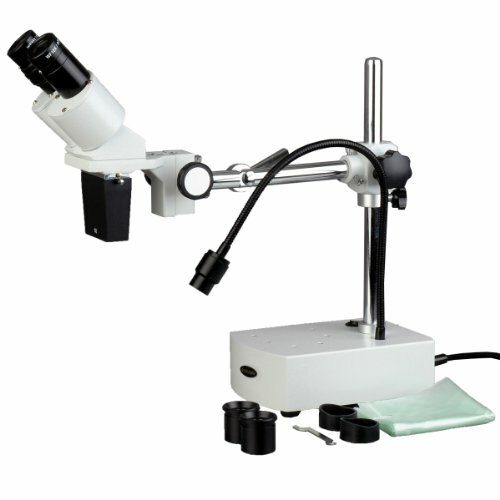 Users find this microscope perfect for jewelry making, scrimshaw work, coins, stamps, and even hobby electronics. This microscope also makes it easy for users to use for longer periods of time as users don’t need to hunch over when using this microscope. Given the great ratings by reviewers and their comments regarding the performance of this microscope we award it 7 ½ stars. This binocular microscope is actually easy to use. Set up is easy for most even with the very limited directions that come with the microscope. The height adjustment allows a good distance for viewing larger objects. The 10X and 20X widefield eyepieces are terrific for viewing fine details. The clear bright objects allow for a clear view while the adjustable light helps to get the clearest focus. The Amscope SE400Z is so easy to use we give it 8 stars. While the AmScope SE400Z is not the best professional binocular microscope on the market it is quite functional for a budget microscope. This microscope has clear bright optics and allows for sharp viewing of minute details. Users do find that this microscope can tip over quite easily. The main complaint users have with this microscope is that in order to get the complete instruction/users manual you need a password that doesn’t always come with the packaging requiring users to have email the company to get the instructions. We give this microscope 7 points for functionality. This microscope has several advantages and a few disadvantages. Here is a look at the advantages and disadvantages that users find when using this microscope. Users find many advantages to using this microscope including the following. Price- The price of this microscope makes it possible for people on a limited budget to own this. 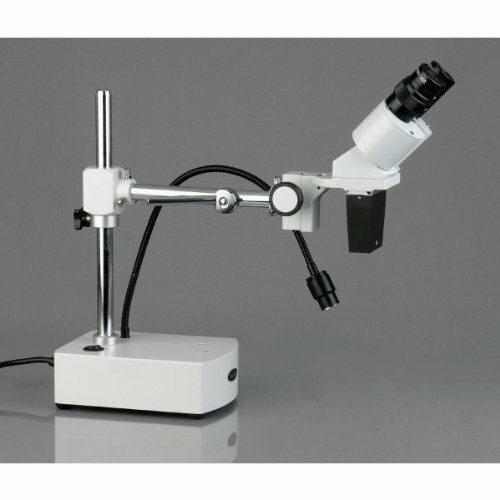 Easy to Set up- This microscope is extremely easy to set up. Easy to use- Most users have little difficulty using this microscope and feel it meets their needs adequately. Durable- with proper care this microscope should last for years. Easily tips over- Several users state that this microscope easily tips over due to the boom arm. Difficulty downloading instruction manual- You need to have an password in order to download the instruction manual and not every box comes with the password making it inconvenient to have to email the company to get a copy of the manual. 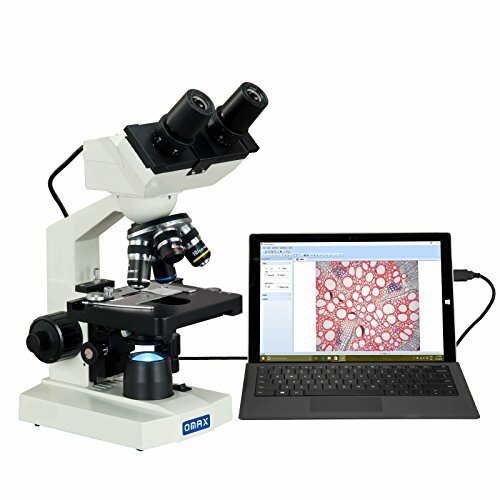 While this isn’t the best binocular microscope on the market, it is excellent for the price and will meet the needs of the serious hobbyist as well as some professionals. This microscope serves users for a variety of uses and most users do find this microscope adequate to meet the majority if not all of their needs. We are a professional reviews site that receives compensation from the Amazon Services LLC Associates Program, an affiliate advertising program designed to provide a means for sites to earn advertising fees by advertising and linking to Amazon.com. We review each product thoroughly and consistently and give high marks only to the very best. We are independently owned and the opinions expressed here are our own. Product data is for informational purposes only. We strive to provide correct information, but are not responsible for inaccuracies. Should you find any errors, please help us by reporting it by our Contact page.